As the sun sets over the town of Migdal Haemek, just outside Nazareth in northern Israel, a white Nissan pulls up to a community center. A slim, neatly dressed man with graying hair steps out of the car, and a dozen people surge forward to take selfies and get a closer look. Inside, the stage is set for a gathering to thank the visitor, Israeli Minister of Finance Moshe Kahlon, for helping the hardscrabble town of 28,000. “And now, in honor of the prime min—” says Eli Barda, the town’s mayor. “Wait, I’m going to get in trouble here. In honor of the … minister. ” It was a slip, but one that resonates in Israel these days. Prime Minister Benjamin Netanyahu faces three corruption probes, and his government almost collapsed in early March in a tiff over the budget. With his future looking shakier than ever, the country’s political class has begun to quietly seek a successor. Kahlon is among a handful of names that rises to the top of the list. “I don’t dream, I’m realistic,” he says in his Tel Aviv office a few days after the Migdal Haemek event. “Being prime minister is difficult and carries a lot of responsibility,” says Kahlon, the 57-year-old son of poor immigrants from Libya. “But I see myself as capable of any job. ” The hardest part of leading Israel, of course, is dealing with the Palestinians, and in that Kahlon’s heritage—he grew up speaking Arabic and Hebrew at home—gives him an advantage. At a meeting last year with Palestinian Prime Minister Rami Hamdallah, an aide warned Hamdallah in Arabic to be wary of the Israeli finance minister. Kahlon turned around, smiled, and gently suggested in the Arabic he learned from his parents that the aide might consider being more respectful. The room erupted in laughter, and now Kahlon is greeted with kisses and slaps on the back when he visits the West Bank. Kahlon quit Netanyahu’s Likud in 2012 to found his own party, and he’s looking to places such as Migdal Haemek to increase his power base. Like many smaller towns in Israel, it’s full of modest apartment blocks hastily thrown up in the 1950s to accommodate Jewish refugees after Israel’s founding. In November, Kahlon’s Ministry of Finance allotted 1 billion shekels ($291 million) to build housing over the next five years—one of dozens of such programs he’s backed since taking over the ministry in 2015. At the rally, a beaming Mayor Barda tells him, “You are an example of someone who climbs the ladder without forgetting where you came from. ” Kahlon rose to prominence as communications minister about eight years ago, when he crafted rules for mobile phones that have helped cut consumers’ bills by 90 percent since 2009. As finance minister, he’s overseen an improving economy: Growth is up, unemployment is down, and incomes have steadily risen, especially among the poor. Kahlon brings “credibility and levelheadedness” to the job, says Yaron Zelekha, who was economics chief under Netanyahu and now runs the accounting program at Ono Academic College near Tel Aviv. An effort to rein in the cost of housing has been less successful than Kahlon’s phone policies. Discounts on land for developers who promise to sell apartments at below-market prices have helped stabilize costs, but they’re still up sharply since Kahlon took office. “His election slogan was ‘I will reduce housing prices,’ and he is completely failing,” says Omer Moav, an economics professor at the University of Warwick in England. Although he was a rising star in Likud, Kahlon felt the old guard would block the social-welfare policies he backed. So he broke with the prime minister and launched Kulanu—or “all of us”—which today has 10 seats in parliament. “I was one of Likud’s most popular leaders and could have stayed comfortable,” he says. “I had a choice: to stay and sell out my values, or take a chance and maintain them. 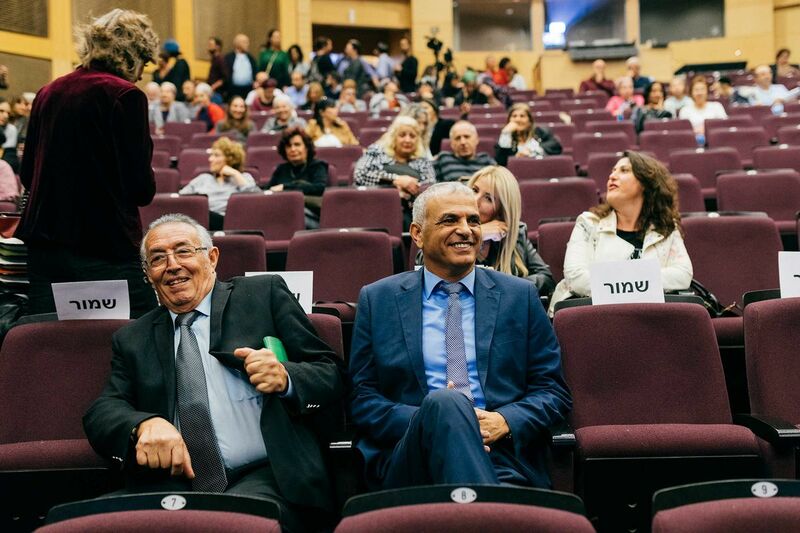 ” Last year, Kahlon was the sole cabinet member to challenge Netanyahu in a fierce debate over creating a new public broadcaster—a plan the prime minister’s allies opposed because they said it would be packed with antigovernment voices. In recent weeks, Kahlon’s threat to bolt the coalition brought the government to the brink of collapse. He wanted to see the 400 billion-shekel budget passed quickly, but ultra-Orthodox parties in the coalition refused to approve the plan without a separate bill exempting seminary students from military service. Kahlon’s defection would have triggered early elections, because Netanyahu needs Kulanu’s support in parliament to maintain a majority. But on March 13 the parties agreed to allow the budget vote to proceed after a compromise that delayed a final decision on the exemption bill. Polls indicate that if Netanyahu were to step down, there’s no clear public preference for a successor. Other contenders include former Minister of Finance Yair Lapid, Zionist Union leader Avi Gabbay, Minister of Education Naftali Bennett, and Minister of Defense Avigdor Liberman. Recent surveys show Lapid’s centrist party would make strong gains if elections were held now, though Likud would still be the largest group in parliament. Kulanu would likely lose a couple of seats. Kahlon, one of seven children of parents who emigrated from Libya in 1949, frequently invokes his humble beginnings as he faces off against members of Israel’s elite. At 14 he started fishing in the morning to support his family, eventually leaving school to work in construction and at the metal workshop of a nearby kibbutz. He spent five years in the military before opening a successful auto parts store. In his 30s he returned to school, ultimately earning degrees in political science and law in Israel before attending an executive management program at Harvard Business School. Kahlon “carries the scars of poverty, and he has a real desire to make sure everyone gets a chance,” says Miri Levy, his neighbor growing up in Givat Olga, a beachfront town about 50 miles north of Tel Aviv. Regarding relations with the Palestinians, Kahlon has made few public pronouncements, and some in the West Bank say he can’t be trusted. Sam Bahour, an adviser at Palestinian think tank Al-Shabaka, says Palestinians shouldn’t put a lot of hope in Kahlon as his views don’t differ much from the mainstream of conservative Israeli thought. Kahlon wants to “maintain the political status quo,” Bahour says. For his part, Kahlon stresses communication, cooperation, and finding ways to boost the Palestinian economy. “It is our destiny to live here together,” he says. With political ties at an impasse and Palestinians reluctant to embrace joint economic projects, “we need to leave the window open, even if it is only a crack,” he says. “When the time is ripe for more political talks, a path for communication will already have been paved.